This is an ornamental, clump-forming grass. Ours have a faded denim color when growing and are showiest from early July through October. In fall and winter, they turn reddish brown and are very attractive. 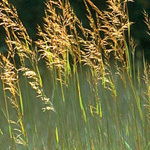 Little bluestem is a valuable forage grass and is one of the most widespread prairie plants in Missouri. It is easy to grow in most soil types and easily tolerates periods of drought. Several types of insects feed on little bluestem foliage, including skipper butterflies and walking sticks, which in turn attract insect-eating birds. Q: When does little blue stem start to green up in the Spring? 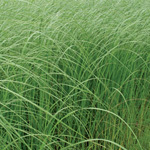 A: Little bluestem is a warm season grass. It begins growing in late spring when evening temperatures are fairly warm. Q: Do you cut this back in Fall or Spring? 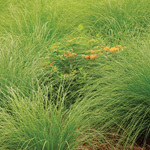 A: It is best to wait until spring before cutting back most of our grasses. Q: Is it a clumping grass? A: Yes, it forms nice round clumps. Q: Is this sold as a seed packet or young plant? Thanks. A: Both. Seed can be sown in the spring. Plants can be installed throughout the year. We are currently out of potted plants, but will likely have more within a month or two. Q: How do you germinate the seeds of Little Bluestem? Can they be winter sown or must they have dry cold stratification? Thank you. 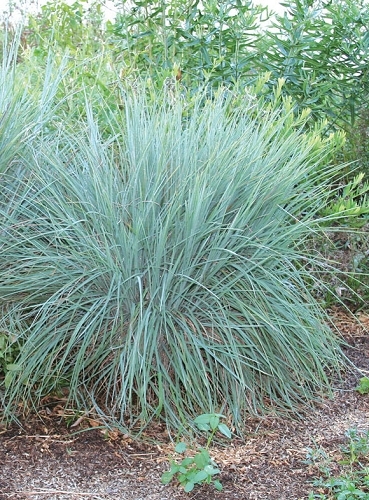 A: Little bluestem is a warm-season grass that will germinate without the cold, moist period that most wildflowers need. You can sow it any time before June. It should germinate when the soil temperature is warm enough.